Born in Sioux City, Iowa, on 1 August 1951, Tommy Bolin picked up on rock and roll music as soon as he was old enough to switch on a TV set. By the age of 13 he was playing guitar in High School bands. 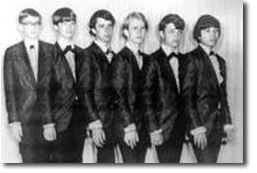 Denny & The Triumphs were organised by George Larvick Sr., father of the band's drummer Brad and original bass player George Jr, who had formed the band as The Triumphs before moving on to The Mustangs. 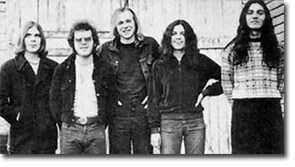 The reconstituted band became aware of Tommy after guitarist Brad Miller saw him playing with a band called the Miserlous. Miller enthusiastically advised the members of Denny & the Triumphs that they should add Tommy to the line-up. Some months later George Larvick Jr sought to rejoin the group, A reshuffle lead to Denny Foote being ousted in favour of Larvick, who brought along a new name for the band - after seeing the 1965 film 'A Patch Of Blue', starring Sidney Poitier and Shelley Winters. photo: Steve Bridenbaugh, Brad Miller, Dave Stokes, Denny Foote, Tommy Bolin. The drummer was Brad Larvick. Considering that the group was made up of younger teenagers, Patch Of Blue played to a high standard and took on a semi-professional stance outside of High School. George Larvick Sr landed them support slots opening locally for the likes of The Beach Boys, The Animals and Herman's Hermits. The variety of material performed included an eclectic mix of pop, R&B, blues and jazz. Tommy developed fast as a player. By the age of fourteen he was doubling up by playing along with old friend John Bartle in The Chateaux, a full-time band based in South Dakota. Along with the step-up from teen to college audiences, Tommy filled out the sound in what was a three-piece group, switching between guitar and Hammond M3 organ. In recognition of Patch of Blue's 1999 induction into the Iowa Rock'n Roll Hall of Fame, the Larvick family released a double CD set of Patch Of Blue live recordings made in 1967 by George Larvick Sr. They show Tommy as a team player, but he was fast outgrowing the band and wanting his playing to be heard. He was eventually fired "for playing too loud". By then other personnel changes had occurred - the singer on the CD is Michael Schwarte rather than Dave Stokes, and guitarist Brad MIller had moved on, to Denver. Once settled there he suggested that Tommy join him to try his luck in the local music scene. photo: Steve Bridenbaugh, George Larvick, Brad Larvick, Brad Miller, Dave Stokes, Tommy Bolin. Following Tommy's departure from Patch Of Blue, and his expulsion from High School (for refusing to have his hair cut) he set off for Denver in the autumn of 1967. Struggling both for somewhere to live and for a regular band to play in, he happened across a rehearsal by local band Crosstown Bus. After being allowed to jam, Tommy impressed enough for them to sack their incumbent guitarist and ask Tommy to join. It was an important early stepping stone in Tommy's career in that it introduced him to the band's singer Jeff Cook, who sang and co-wrote with Tommy in the following years. The renamed American Standard became house band at The Family Dog night club, Denver, which brought Tommy into contact with the club's manager (and soon to be his manager) Barry Fey. 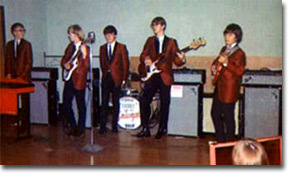 The band failed to make much of an impression beyond the Denver area, and broke up in early 1968 when Tommy was approached with the offer of work in Cincinnati. Once there he had short stints backing rock / blues musician Lonnie Mack and formed the short-lived band The Ginger People with keyboard player John Faris. That band bit the dust when their drummer died, and his parents promptly sold off all of their equipment - leaving Tommy destitute. He returned to Colorado, and formed another band with John Faris, this one called Ethereal Zephyr. 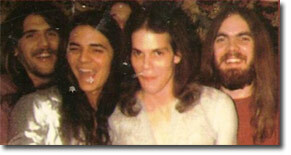 photo: Tommy Bolin, Michael Lothamer, Terry Knieff. (The girl is Lothamer's girlfriend) Vocalist Jeff Cook took the photo. Ethereal Zephyr soon parted with their bass player, who had been responsible for naming the band, leaving Tommy Bolin and John Faris amenable to putting together a new project - with a new name. They jammed with David and Candy Givens' band Brown Sugar in Boulder and began plans to form a new band with them. The name Zephyr was settled upon, and drummer Robbie Chamberlin was brought in to complete the line-up. Zephyr was a further step up the ladder for Tommy, who was still only seventeen. The band wrote their own material, landed a record deal (albeit with ABC, who didn't know what to do with them), and were booked on a national level. Barry Fey landed them support slots with Led Zeppelin and Jethro Tull, but aggravated the band by trying to curtail their local headlining shows in Boulder. The band's self-titled first album was released in 1969. Recording it was not a happy experience, with unsympathetic production and the band worn out by multiple takes. The band's first personnel change came in May 1970, when Robbie Chamberlin was asked to leave - a decision which ultimately contributed to the band's demise. 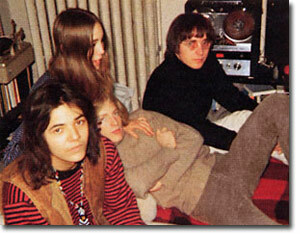 photo: Robbie Chamberlin, David Givens, Candy Givens, John Faris, Tommy Bolin. Chamberlin's replacement was Bobby Berge, an old friend of Tommy's, but by the time that Zephyr's second album "Going Back To Colorado" was being put together in New York dissatisfaction was growing regarding their musical direction. Despite being a big improvement on their debut, "Going Back To Colorado" was released in an unfinished state due to producer Eddie Kramer's pre-occupation in dealing with Jimi Hendrix's death and its aftermath. Enthusiasm continued to drain from the band, as the jazz influences which Tommy and Bobby were introducing failed to find favour with David and Candy Givens. There was also increasing live competition between Candy and Tommy, with Bobby Berge's hard-hitting style coming down firmly on Tommy's side. After delivering an ultimatum in which the Givens's demanded that Chamberlin be reinstated, Tommy and Bobby opted to leave. Zephyr continued on for one more album, the more laid back "Sunset Ride", with Tommy replaced by Jock Bartley. David and Candy Givens played again with Tommy, in the more relaxed guise of The Legendary 4-Nikators, playing covers shows in Boulder clubs. This lead to a brief Zephyr reunion show at Art's Bar & Grill, Denver, on 2 May 1973.
photo: Bobby Berge, John Faris, David Givens, Candy Givens, Tommy Bolin. During the recording of "Going Back To Colorado" in New York Tommy had made contact with a number of like-minded musicians who were keen on exploring the jazz-rock path being opened up by John McLaughlin's Mahavishnu Orchestra. One of them was flautist Jeremy Steig, who persuaded Tommy to return to New York after Zephyr's demise. Tommy played for a month or so during 1971 in impromptu bands going under the The Jeremy Steig Group name. Alongside Steig himself, were drummers Billy Cobham and Alphonse Mouzon, and keyboard player Jan Hammer. Some studio demos were recorded, with the track "Sister Andrea" eventually being released on the first Tommy Bolin "From The Archives" collection in 1996. When Tommy returned to Boulder, he set about forming Energy (named after Jeremy Steig's 1970 jazz-rock album). Bobby Berge was first on board, followed by Stanley Sheldon on bass and Stanley's cousin Tom Stephenson on keyboards. Singer Gary Wilson was last to join. Energy landed residencies at clubs in Boulder, and provided backing for visiting musicians such as Albert King and Chuck Berry. Shortly after joining the group Energy began recording studio demos, including "Red Skies", which was released on "From The Archives Vol.1". However, Wilson's R&B / soul leanings were at odds with the band's music and he bowed out to be replaced by Tommy's old American Standard bandmate Jeff Cook. Cook established an excellent writing partnership with Tommy, but although he was more of a 'rocker' than Gary Wilson, his limited vocal range was a handicap. Nonetheless, songs written during this period eventually helped to furnish albums by The James Gang and Deep Purple, as well as Tommy's solo albums. A number of live and studio demo recordings have surfaced of the Jeff Cook line-up, featuring instrumental jams and blues / rock work-outs, with the jazz element less prominent due to the presence of the vocals. The band failed to land a record contract, exacerbating the financial difficulties that would lead to its dissolution. In early 1973 Max Gronenthal (also known as Max Carl) was drafted in to replace Jeff Cook, but the band were on their last legs. Tom Stephenson quit to join Joe Walsh's post James Gang band Barnstorm, and was also replaced by the multi-talented Gronenthal, before the band folded completely. In May 1973 Tommy returned to New York to help record Billy Cobham's seminal "Spectrum" album. Cobham had left The Mahavishnu Orchestra earlier in the year, coinciding with the end of Energy, and chose Tommy to play on the sessions, remembering his performances on Jeremy Steig's 1971 New York demos. Spectrum was a huge opportunity for Tommy to play the kind of music which was closest to his heart, and he took it with both hands. The results were stunning, bringing him to the attention of musicians worldwide. It is considered the best recorded showcase of Tommy's playing ability. Sadly, the success of Spectrum was not built upon. Having opened new musical territory Billy Cobham returned to working with horn sections, which lead to Tommy turning down his offer of touring the album. Tommy also wanted to put his own solo project together, and was promised the financial backing required if he accepted a one year offer to play with The James Gang, a band he reportedly disliked because of their overly commercial brand of rock. The James Gang were an Ohio based band who had achieved their greatest successes in 1970-71 with guitarist / vocalist Joe Walsh at the helm. When Walsh left, they drafted in Canadian pair Roy Kenner on vocals and Domenic Troiano on guitar. Neither were considered successful replacements for Walsh and the band's profile dropped. 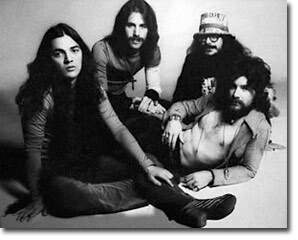 After two albums Troiano departed, and on Joe Walsh's recommendation Tommy Bolin was asked to join. Tommy was able to furnish the next James Gang album - 'Bang' - with a crop of songs written for Energy, and even one which dated back to his American Standard days ('Must Be Love'). He was given the space to perform, although always in the shadow of Joe Walsh and within the constraints of the band's musical style. Although pleased with Tommy's contribution, the others were dismayed at his level of substance use, which had been steadily growing since his time with Energy. Dale Peters later described it as "a horrible, unbelievable drug problem". It was Tommy's wish to experiment with music which caused the final fracture. After recording the album 'Miami', which included Energy composition 'Red Skies' as its most experimental piece, he quit the band and struck out on his own for his long promised solo career. Tommy began to try and build his solo career in Boulder, while taking the opportunity to perform with musicians such as Energy bassist Stanley Sheldon, drummers Alphonse Mouzon and Carmine Appice, and Long Island rock group The Good Rats. One live Tommy Bolin and Friends performance from the Ebbet's Field venue was released by the Tommy Bolin Archives in 1996, while a jam with Appice and The Good Rats appeared on "The Bottom Shelf" in 1995. After accepting an offer from Mouzon to play on his "Spectrum" influenced solo album "MInd Transplant" Tommy shifted his base of operations to Los Angeles. While there he also played sessions for Dr John's "Hollywood Be Thy Name" album - which it seems were subsequently scrapped, and added lead guitar to six tracks on Canadian rock group Moxy's eponymous debut album. With Stanley Sheldon in tow, Tommy spent the next months recording studio demos and trying to put together a new band, which for a time was set to re-animate the Energy name. Drug and alcohol issues continued to increase and to disrupt plans, causing vocalist / keyboard player Mike Finnigan to back out of a prospective collaboration. Finnigan later played on David Coverdale's "Into The Light" solo album. A band was eventually finalised in January 1975, with Bolin and Sheldon joined by old Energy drummer Bobby Berge and vocalist / keyboard player Ronnie Barron, but it did not survive far beyond rehearsals and a record company audition. Other musicians to record with Tommy included ex-Beach Boys drummer (and future Rutle) Ricky Fataar, while his drug-fueled jams with various artists at Glen Holly Studios were captured and later released by the TBA. Further unsuccessful attempts at getting a band together included bringing in ex Captain Beyond drummer Guille Garcia and percussionist Marty Rodriguez in place of Bobby Berge. The original Energy connection was cut further when Stanley Sheldon was offered a place in Peter Frampton's touring band. Two weeks after Sheldon's departure Tommy's biggest break presented itself when he was asked to audition for Deep Purple. This coincided with a solo deal arriving from Nemperor Records, given to him on condition that he sang the material. An agreement was put in place for Tommy to both be a member of Deep Purple and have his solo career run in parallel. Tommy's fabulous solo album "Teaser" was recorded in New York and LA. Writing sessions with Jeff Cook and long-time lyricist John Tesar were done over the phone, although some of the material dated back as far as 1972. In New York his fusion contacts such as Mahavishnu Orchestra players Jan Hammer and Narada Michael Walden joined the sessions, along with Stanley Sheldon, who at the time was involved in the mixing of the soon to be stratospheric "Frampton Comes Alive" album. Although the sessions were successful, Hammer noted that there was "a drug fog descending." Tommy Bolin's first studio outing. Features many of Zephyr's best tracks - progressive blues with Hammond foundations, but primitively recorded and with Candy Givens' distinctive vocal style perhaps not presented in its best light. Zephyr. A big sonic improvement on their debut album. The material is more laid back. Highlight track is "See My People Come Together". Billy Cobham. The definitive jazz-rock album, with some of Tommy's best recorded guitar work. James Gang. Tommy's first studio album with the James Gang. Tommy contributed every song with the exception of a short acapella piece by singer Roy Kenner. The album includes his first vocal performance released, on "Alexis". James Gang. Includes more songs written with his old Energy bandmate Jeff Cook. Perhaps not as strong as "Bang", although more consistent. Also released in 1974 as a Quadraphonic edition. Alphonse Mouzon. Drummer Mouzon was Billy Cobham's main rival in the 1970s, and brought Tommy in to play five tracks on this "Spectrum" influenced album. Issued on CD by RPM with a bonus track of Bolin / Mouzon jams from LA. 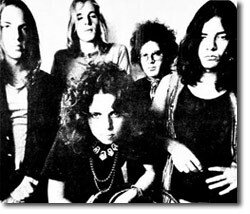 Tommy played guitar solos on six out of eight tracks from Moxy's eponymous debut album, released in 1975. Two tracks from the album were included in the 1989 Tommy Bolin box-set "The Ultimate". The 2001 Billy Cobham compilation "Rudiments" includes remixes of all of the "Spectrum" tracks featuring Tommy, and the out-take "All 4 One". Patch Of Blue. Double CD featuring 15 year old Tommy Bolin on lead guitar. Recorded on two track in Sioux City and Correctionville, Iowa in early/mid 1967. Deleted. Energy. 2xCD set, combining a disc of studio recordings originally released by the TBA in 2000 with a live disc from the Jeff Cook era titled "Energy Live at Tulagi and the Rooftop Ballroom". Deleted. Energy. 2xCD live set, originally recorded off-air from live shows performed at Summit Studios, Denver in 1972. Questionable sound quality. Deleted. Zephyr. Reunion show recorded in Boulder, Colorado, 2 May 1973. Largely made-up of blues covers and tracks from the band's debut studio album. Deleted. Tommy Bolin & Friends. Recorded in Boulder, 1974 with Stanley Sheldon and others. A set of blues covers recorded off-air from a radio broadcast. Deleted. Tommy Bolin & Friends. As the TBA stated "If you own the full Ebbets Field 1974, you have the best of the two nights of music, but these out takes are still worthwhile." Sold without a sleeve to minimise costs. Deleted. Tommy Bolin & Alphonse Mouzon. A series of jams recorded during warm-ups for the "Mind Transplant" album. Some familiar themes, but really one for those who can take a long jam. No sleeve. Deleted. Tommy Bolin. Double CD of loose jams recorded at Glen Holly studios 1974-75. The titles are "Jam 1", "Jam 2" etc. For jam lovers only. Other musicians include Stanley Sheldon and Bobby Berge. Deleted. Tommy Bolin. 2xCD. Acoustic solo demos. Most from disc1 had already been released on previous TBA compilations. Disc 2 was all new, but was a more sketchy and less essential set of noodles and ideas. Tommy Bolin. A second collection of acoustic and electric solo demos. 18 tracks. Demo versions of solo album tracks through to untitled sketches. Deleted. Tommy Bolin. Teaser demos recorded in LA, 1974-75. Some great performances. Also includes three long jams from the period. Great sound quality. An album of 17 ‘previously unreleased’ Tommy tracks recorded by a variety of current artists, including Doogie White who sings on a couple. Acoustic demos of most (if not all) of the tracks have appeared on TBA releases in the past, but here they are presented as full band electric performances, (without Tommy) in the way that Tommy might have recorded them given the chance. Surprisingly good it is too. The Tommy Bolin Archives released other random collections of Bolin material: "From The Archives" Vol.1 and 2, and "The Bottom Shelf". Some of the tracks turned up again on other releases (notably the acoustic demos). "The Bottom Shelf" was described by the TBA themselves as having some material "for diehards only" - ie. unfocused noodlings. However it did include a live version of "Stratus" recorded in 1974 with The Good Rats. The Tommy Bolin Archives also released a 2xCD collection of Tommy Bolin interviews called "In His Own Words". "The Ultimate Redux" is A three CD collection from the 1996-2004 Tommy Bolin Archive releases.